Relationship Manager Herb teaches financial literacy in Boston's Chinatown neighborhood. Meet Relationship Manager Herb, financial literacy mentor for the Boston Chinatown neighborhood. Herb is a Business Banking Relationship Manager (RM) for the Citizens Bank Chinatown and Franklin Town branches. 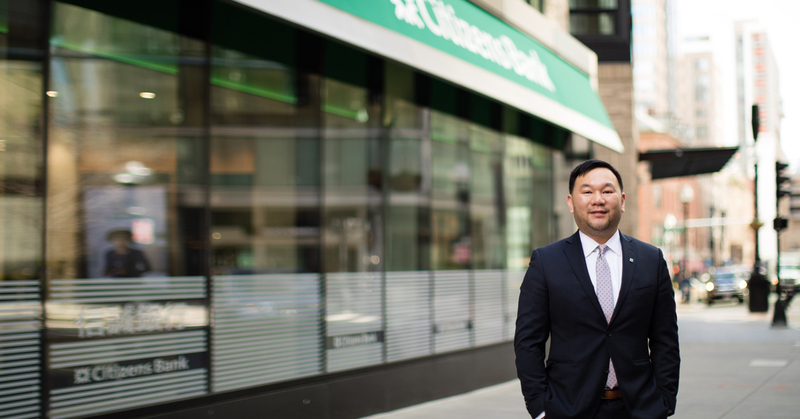 A 17-year banking veteran, Herb started out as a personal banker, worked his way up to a branch manager, and recently transitioned to a relationship manager. As an RM, Herb supports small and medium-sized businesses with financial solutions to help them grow, save and expand. Many of Herb’s clients are Chinese business owners in the larger Boston Chinese community. Early on in his banking career, Herb became involved with the Asian American Civic Association (AACA). This community organization provides limited English speaking and economically disadvantage people with education, occupational training and social services to help them attain economic self-sufficiency. Herb began volunteering his time to conduct financial coaching and teach financial literacy workshops to AACA students. The significance of the work Herb does is never lost on him. “As the son of an immigrant, I am so proud of my mom who paved the way for me and gave me opportunity. Helping out in the community is my little way of giving back,” concludes Herb. Learn more about other outstanding colleagues like Herb and the ways they give back to the communities in which they work.